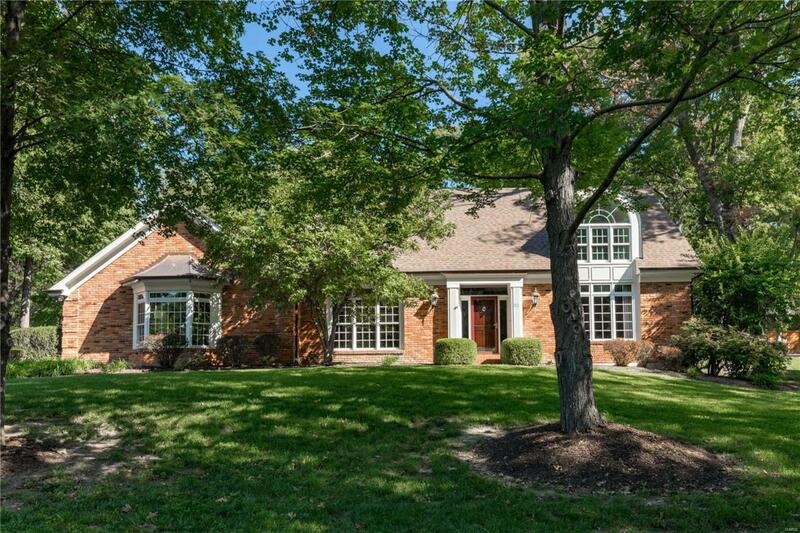 Custom built 1.5 story home, 38 yrs new, on a cul-de-sac street, w a flexible bedroom flr plan in the heart of Ladue. Enter through the open foyer to custom leaded glass French drs that enter into the dining rm & formal living rm/den with rich wood paneling. The family rm has a full masonry wood burning fireplace flanked w built in bookshelves and adjacent wet bar. The kitchen includes newer double ovens & downdraft gas cook top in the center island & a planning station & a breakfast area. Sliding glass drs walk out to a private rear patio. The first flr has a main fl master suite option w a bay window & kitchenette. The 2nd flr has an additional master suite w walk-in closet. 2 additional bedrooms & a hall bath complete the 2nd level. The owners paid special attention to quality finishes such as Pella windows, copper roof accents, 9 ft ceilings. Other Features: Freshly painted, new carpet, sprinkler system, central vac, copper gutters, roof 6 yrs old, & 2 car attached garage.